April is known as "mud season" in mountain towns like Driggs and Jackson. Plenty of snow remains up in the hills, but it gradually melts off in the valleys...leaving lots of, well, mud. Locals grow weary of endless winter, and are known to flee to the desert for a break this time of year. I joined the movement last week, and it was sweet. 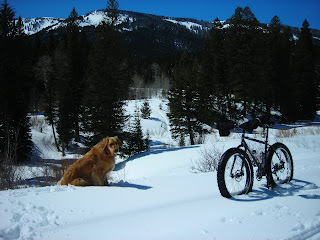 Saturday found me snowbiking in Driggs with Bridger, and 24 hours later I was mountain biking in the desert of Southern Utah. 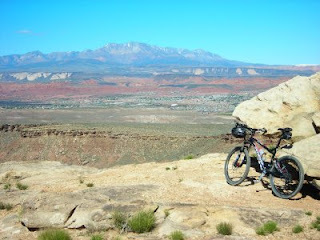 This photo is from a favorite viewpoint outside St. George. It's a beautiful thing, and a perfect antidote to all the mud around Driggs at the moment. It felt great to be warm and rolling on dirt again. 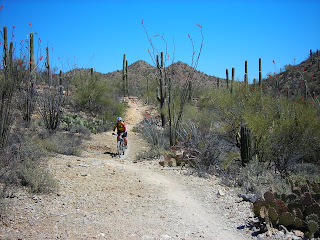 It got even better around Tucson, AZ, which is a surprising outdoor mecca. I hope the warmth makes its way up to Driggs before June...but I know better :-) Stay tuned.